A NEW book detailing the history of religious life in the village of Ravernet has arrived on the bookshelves. This time Ravarnette (or Ravernet), situated midway between Lisburn and Hillsborough, is the focus of attention — looking back as far as the arrival of the Huguenots who introduced the village weaving trade to this area. From the onset of industry, the developed. Through the goodwill of local land and mill owners this small neighbourhood progressed and families made Ravarnette their home. Ravernet — A Century of Grace is the third book by local author Mavis Heaney, following on from Lisburn — Life in the County Down and To God Be the Glory (the Personal Memoirs of Rev. W. P. Nicholson). The book recalls how the first place of learning for the local children was in a farm loft belonging to Mr. John Sinton who owned the weaving factory. In time this generous benefactor donated one of his properties for the use of the children and this became Ravarnette Public Elementary School, situated on the crossroads. This school house also became the first base for public worship. However, it wasn't until 1910 when two young women from Scotland known as Pilgrims, (workers of the Faith Mission (Edinburgh)) came to hold a mission in the school - that weekly Christian witness and times of prayer were established on a regular basis. Mavis recalls those days when life was lived at a quieter and more gentle pace, when the preachers arrived in horse and trap, charabanc's were the mode of transport, the only form of lighting was by oil lamp and a familiar sound was that of the clang of the hammer of the village blacksmith, Alex Long. In the midst of this the children had a Sunday School to attend, the men had their own weekly Bible Study and a regular weekly Gospel meeting took place each Sunday. Over the years the permanent meeting place moved to the building which is now known as Ravernet Mission Hall, based on the corner of the crossroads. Throughout the decades many more Faith Mission workers found their way to village. This Centenary Year, 2010, also began with a Gospel Mission by Andrew McCullough and Timothy Condy during the worst winter weather seen in years. Church denominations of bygone years - well known local preachers like Willie Collins who preached every Tuesday morning in Lisburn Market, and with colleagues from The Tansy Mission Hall, for years held a Weekly Service at the Department of Elderly Medicine at Lagan Valley Hospital. His life story and testimony is given in full along with his that of his associate in tent mission work Joe Kerr, who was a cabinet maker in Sans Souci Gardens, Lisburn. The Cregan family, Thomas and his sons Billy and Clarance, who were Builders based at the Antrim Road, Lisburn in the mid 1900s , not only did work on the Mission Hall, they also occupied the pulpit. 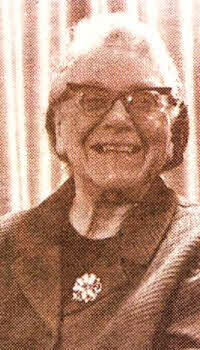 Clarance Cregan was also a skillful accordionist and singer. The story of Seth and Bessie Sykes, famous for their hymns and choruses, has also found its way into the book. They began visiting Lisburn and other towns in Northern Ireland around the 1940s and are remembered for their lantern slides shown in Market Square. 'The Pilgrims Progress', 'The Sinking of the Titanic' and 'There were Ninety and Nine' were among these. John Thompson, who leads the work at Knocknadona Gospel Fellowship, remembers Mrs. Sykes with fondness: "For years she started off the winter work in Knocknadona with a week's meetings, commencing the first Sunday in September," said John. Rev. 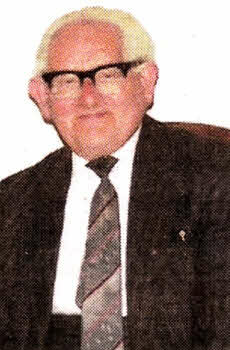 Ronnie McCracken from the Crumlin area conducted a Gospel Mission at Ravernet in 1971. After the collapse of Communism Ronnie was deeply involved in taking shipments of aid to Russia, Belarus and other countries of the former Soviet Union. 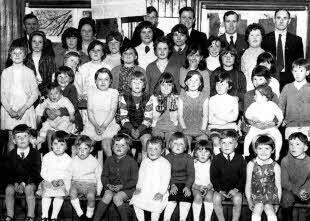 For nearly 20 years from the late 1960s a Bible Club for children was run by Mr. Tommy Frazer of Lisburn (a well known painter and decorator) who preached at the Mission Hall on a regular basis for years. Tommy's personal testimony begins around the time he worked on the Heat Setting Machines at Hilden Mill. Along with Mr. Trevor Herron, he conducted a Gospel Mission in Ravernet in 1988 when many people found Christ. Mr. Wolsey Ward (known as 'The Yodelling Buckaroo' in earlier years) had previously been a singer in the entertainment business before his conversion. Evangelist Harvey Shaw was also a frequent visitor over the years. His life story and testimony is one of dedication to his role of evangelist in the face of adversity. Lagan Valley MP Jeffrey Donaldson also shares his testimony in the book telling of family life in the Mourne district, his introduction into politics and his conversion to Christ. Behind all the preaching, singing, missions and children's work there has been ongoing dedicated leadership over the years. These too have been given their place in the book. 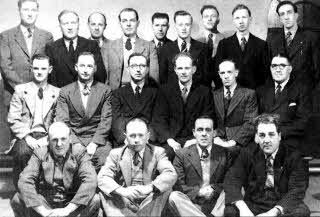 Among them are Mr. James Cowan, and Mr. Jack Hill. Since 1999 the Mission Hall has been led by Miss Heather Reddick. Ravernet — A Century of Grace is priced at £8 and is a limited edition. It is available at the Faith Mission Bookshop, 2 Chapel Hill opposite the Mall, and also the Linen Centre, Market Square. Churches and Mission Halls can telephone 07598156191 to order books or arrange delivery. Book size 16.5 cm. x 24.5 cm. Full Colour 300 gm. Cover. Photographs approx. 130 black and white and some colour. 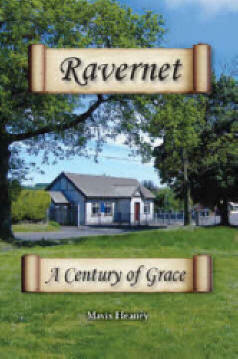 'Ravernet - A Century of Grace' covers 100 years and more of Christian witness in the village of Ravernet. Life from around the late 1800s sets the scene in this picturesque village situated midway between Lisburn and Hillsborough. Surnames of residents are included from as far back as 1863, the mill owners, life in the public elementary school, and the commencement of regular weekly gospel meetings through a visit from two young women of the Faith Mission in 1910. Meetings were initially held in the School House and later the Mill Reading Room renamed Ravernet Mission Hall. Those who have led this work over the years are given their place. However, the lives of many who came to minister in word or song feature largely in the book, and while they vary in their denominational affiliation, all brought the same message of the Gospel which is still preached today in Ravernet Mission Hall. Poems and extracts relating to the Christian life have been carefully selected, and give this easily readable book much interest and spiritual food for thought.